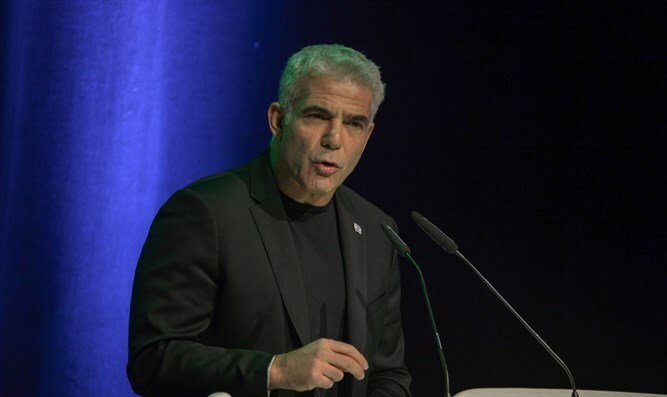 Former Finance Minister and Yesh Atid party chairman Yair Lapid blasted Prime Minister Binyamin Netanyahu Monday evening, accusing the premier of using the upcoming elections to shield himself from a series of criminal investigations. Speaking at a conference of hosted by the Movement for Quality Government in Israel (MQG) in Modi’in Monday evening, Lapid claimed that Netanyahu has framed the upcoming general election – slated for Apri1 9th – as a referendum on three investigations against him, hoping to use a victory at the ballot box to justify axing the probes after the election. “He wants elections to be [focused] on the investigations because if he wins he believes he’ll have a mandate to shut down the probes,” Lapid said. Netanyahu currently faces the possibility of fraud, breach of trust, and bribery charges in connection to three separate police investigations, named Case 1000, Case 2000, and Case 4000. Police have recommended indictments against the prime minister in all three cases, which relate to accusations Netanyahu and his family received gifts from a wealthy businessman in exchange for political favors (Case 1000), claims Netanyahu offered to advance legislation beneficial to a newspaper in exchange for favorable coverage (Case 2000), and accusations he pushed for regulatory changes which would benefit the Bezeq telecommunications firm in exchange for favorable coverage from an outlet owned by a key Bezeq stockholder (Case 4000). Lapid also claimed Monday night that should Netanyahu fail to win a fifth term in this April’s election, he would ultimately be indicted, convicted – and sentenced to jail, adding that Netanyahu was ‘panicking’. The Yesh Atid chief also argued that Netanyahu was relying on the police investigations against him to rally his base.